Reception Classes China Red and China Blue worked on a cracker project to raise money for new white boards for their classroom. Each child designed a cracker cover, shared jokes and made clay animals to be a gift inside the cracker. They then sold the crackers to parents throughout the school. The total raised was over £300. Report by Miss H Beadle, Reception Class Teaching Assistant. Christmas arrived early for KS1 - Years 1 and 2 as the children used salt dough to make a Christmas decoration as well as the initial of their first name. Children chose a Christmas decoration that they wanted to make and they then cut them out and decorated them. The children also cut out their initial and decided on the design, the colour, the pattern and whether or not to add glitter. These decorations and initials were all varnished and sold to parents at a coffee afternoon, where refreshments were enjoyed whilst the children entertained the guests with singing. Great fun was had by all, and the money raised will be used to buy maths and English games for the children to use in their classes. Report by Mrs Debbie Gilpin, Year 1/2 Leader. Children in Years 3 and 4 had an extremely productive week making a variety of objects in a bid to raise money for the year group. The children had great fun making friendship bracelets and peppermint creams which were sold later on that week. The children delighted in the items being sold incredibly quickly, and received positive reviews by children and adults alike. The children also made Christmas lanterns from jars, tree decorations in the form of felt stockings and glittery Christmas trees. All of these will be sold at the school’s Christmas Fair on Friday 7th December. The classes were also fortunate to have the invaluable help of many parents throughout the week, who helped the children with their sewing and constructing of decorations. Report by Mrs Corrine Wellby, Year 3/4 Leader. Children in Years 5 and 6 were challenged to make a new healthy snack that could be sold at break time to the rest of the school. After some deliberation, they decided to make granola bars. They started their week by conducting some market research in order to find out which flavour bars would sell the best, and produced tally charts of the data collected. There was also a fair amount of taste testing of different ingredients undertaken! After they had established their ingredients, children worked groups to create an identity for their product. They designed, edited and finalised a brand name, a logo and a slogan for their product, designed packaging, and produced posters and adverts to promote it. The children then made their bars using the fruit that their groups had chosen. Once ready, they packaged up their product and sold the bars to the rest of the school during break time on the Thursday. After evaluating what worked well and what needed improvement, the children had a second opportunity to make some bars, this time to be sold to their parents after school on the Friday. 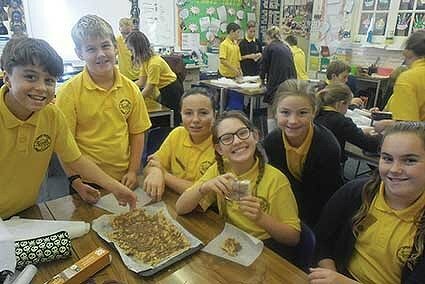 The children were amazed at how incredibly quickly their granola bars sold, and loved receiving the positive reviews from children and adults alike. A was a huge success, with Y5/6 making over £200 profit. Report by Mr Elliot Moule and Miss Julia Francis, Year 5/6 Teachers.